Find information on the Village of Baron’s municipal facilities and parks, including locations, rates, hours of operation and contact information. The Village of Barons is proud to be a member of the Chinook Arch Regional Library System. Residents who pay a nominal fee have access to all 32 member libraries! For a complete listing of member libraries and the many services available visit the Chinook Arch Regional Library System website. 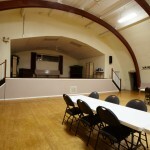 The Baron’s Community Hall is ready for your booking! If you would like to make a booking, please call the Community Hall Director at (403) 757-2023 and book your event today. Capacity: 350 – non-fixed seating & tables “licensed”. Stage – Perfect for entertainment, DJ’s, Bands, etc. Wet bar – located in the main area. Kitchen – Fully modern kitchen with appliances. The Community Hall backs onto a playground for the children and a picnic area on the side to enjoy those lazy summer days.